May I just say, Happy Mother’s Day to all of you out there who are mothers or act like mothers. I hope you get breakfast in bed, or lunch out, or that long distance phone call you’re waiting for. I hope you get whatever it is you need today. I’ll be calling my own mama here in a little bit and, as much as Mama Kat and I have our differences, I know no one cares for me more than her. It’s just that mother/daughter relationships can be kind of complicated. But isn’t that the way it is with any sort of relationship? We’re human and we all have baggage and, well, there it is. Some of you have fierce mamas like mine. Shoot, some of you may be fierce mamas. Others may have sweet, quiet mamas. Some of you may have (or be) never-stop mamas who work and run and keep the chaos under control. Mothers come in all shapes and sizes and temperaments. Sometimes life gives us the mother we need. In other cases we find mothering in someone else who cares for us like a mother. Doesn’t matter. It’s all motherhood. In the animal realm, mothering instincts often create some odd pairings. 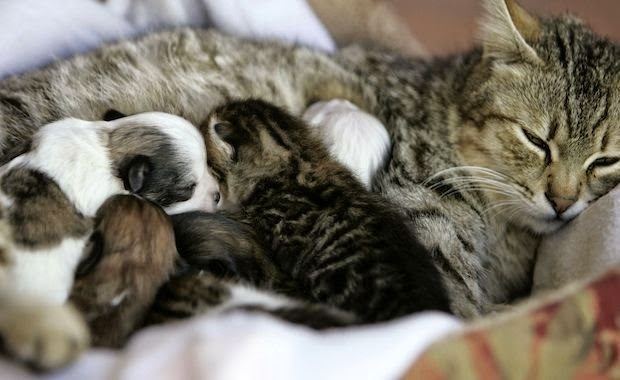 These puppies lost their mother in a car accident but were adopted by this mother cat. 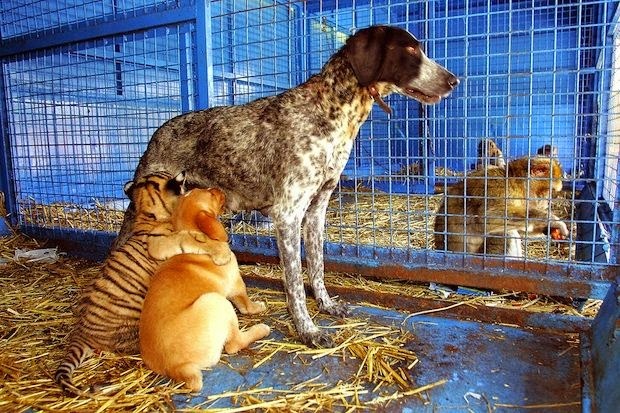 This two-month old tiger was adopted by this mama dog after her mother rejected her. Turns out Robert Browning was right. All love begins and ends with motherhood. But you see it doesn't really matter what your mother looks like or how you got her. It matters that she loves you. So, whether you mother your children or siblings, or nieces and nephews, or friends and neighbors, or your fur-kids, here’s to you! My latest adventure is chronicled in the latest Sparkle Abbey book. FIFTY SHADES OF GREYHOUND. It starts with a benefit for a worthy cause, Greyhound rescue. But what starts out as a lovely evening ends in chaos and by the time things are sorted out, a man is dead. It all ends up alright in the end but, I find myself involved in a sting operation and some dangerous hijinks. I think you'll enjoy reading about it, but just don't tell Mama Kat. Okay? Delightful post, Caro, about all kinds of moms! 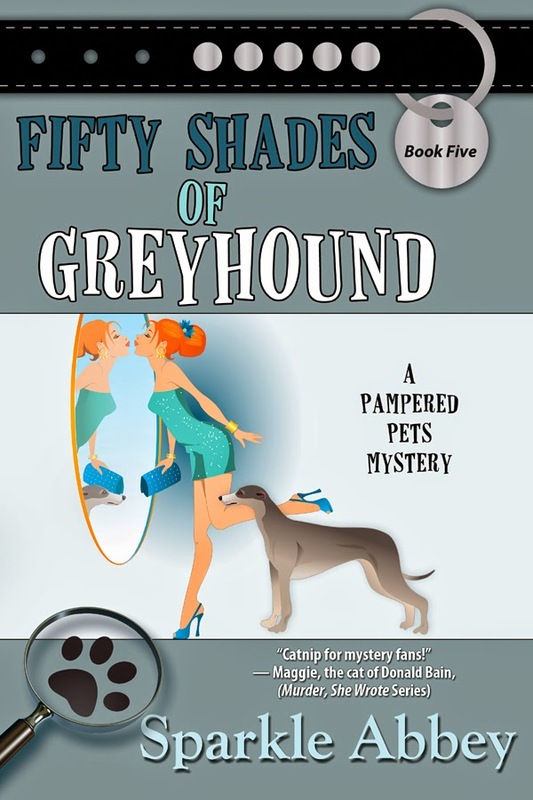 Looking forward to Fifty Shades of Greyhound. Aww, you couldn't have said it better. Happy Mother's Day to Mama Kat, and Sparkle Abbey, and especially to all the moms like the brave cat and dog who go out of their way to mother someone.